The Historical Archives is the official record keeper of the European Parliament. It manages and preserves the Parliament's official public documents and other archival fonds, dating back to 1952. It also assists researchers on the history of the Parliament and European integration, publishes studies and articles on these subjects, and works closely with the EU Historical Archives at the European University Institute and the House of European History. The Historical Archives of the European Parliament from the European Parliamentary Research Service (DG EPRS) together with the Former Member's Association (FMA) and the European University Institute (EUI) organised on 03 April 2019 a round table on the development of the European Parliament as a new institution following the first direct election by universal suffrage in 1979. The round table brought together in a first panel researchers who have written substantial studies of different aspects of the European Parliament's role and development during the first two legislatures as directly elected Parliament: Professors Birte Wassenberg, Wolfram Kaiser, and Laurent Warlouzet. A second panel, included actors in the making of the new institution: former European Parliament Presidents Hans-Gert Pöttering, Ennrique Barón Crespo, Pat Cox, and Klaus Hänsch, and former Vice President Charlotte Cederschiöld. Each of these former Members of the European Parliament made statements in support of the European Parliament ahead of the elections. 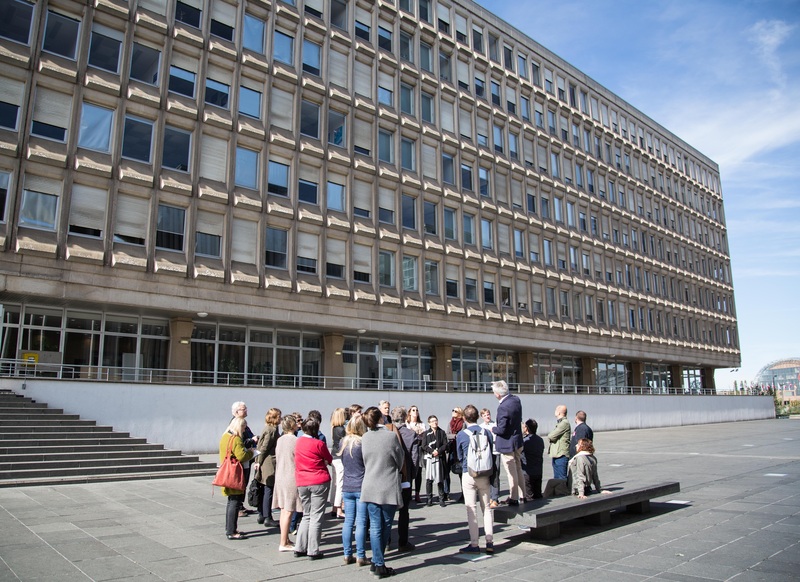 During the 2018 European Heritage Days in Luxembourg, two guided tours were organised in the Schuman Building in a cooperation between the Luxembourg Centre for Contemporary Architecture (LUCA) and the Historical Archives Unit. This year, in the specific context of the European cultural heritage year, the Luxembourg National Sites and Monuments Service had decided to showcase the people connected with 'European buildings' throughout the country. Since 1973, the Schuman Building has been home to a number of departments of the European Parliament's secretariat. A living testimony to a period of strong growth and major changes for the European Parliament, the Schuman Building faces an uncertain future as it might be soon demolished as part of a major redevelopment project on the Kirchberg Plateau area. Visits took place on 25 and 26 September. Visitors - mostly architects and art historians - were provided with explanations relating to the history of the Schuman Building and the various stages of the collaboration between the Secretariat of the European Parliament and the Luxembourg government, thanks to the archival material (architectural plans, correspondence, photos, ...) stored in the rich collections of the Historical Archives, the official record keeper of the European Parliament. On 14 April 1989, the European Parliament adopts a resolution on restrictions on exports of strategic products and technology transfer between the United States and the European Economic Community (EEC). While recognising the need to restrict technology exports to certain countries, Parliament recommends that the list of the Coordinating Committee for Multilateral Export Control (CoCom) be limited to state-of-the-art security technologies.